Railmotor No.93 and Trailer No.92 given the right-away by impeccably dressed guard - Matt Baker. 4 May 2013 saw the final chapter in the restoration of unique Steam Railmotor No.93 and Auto-trailer No.92. The pair were formally launched into traffic by Lord Faulkner of Worcester, former advisor to the British Railways Board, member of the Railway Heritage Committee, and treasurer of the All-Party Parliamentary Railways Group. He launched the pairing of Steam Railmotor No. 93 and trailer No. 92 as a steam multiple unit - possibly the only working one in the world - at Didcot Railway Centre. 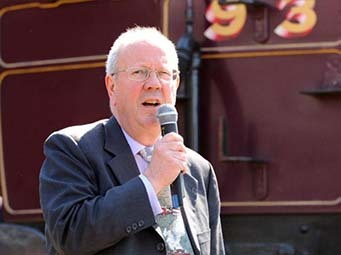 In a brief speech, Lord Faulkner noted that “The railmotor is a very important part of Britain's railway history, because it was a way the railways could respond to competition from trams and buses. They became so popular that a trailer had to be added. What is marvellous about today's event is that the Great Western Society is recreating a practice from about 1910”. 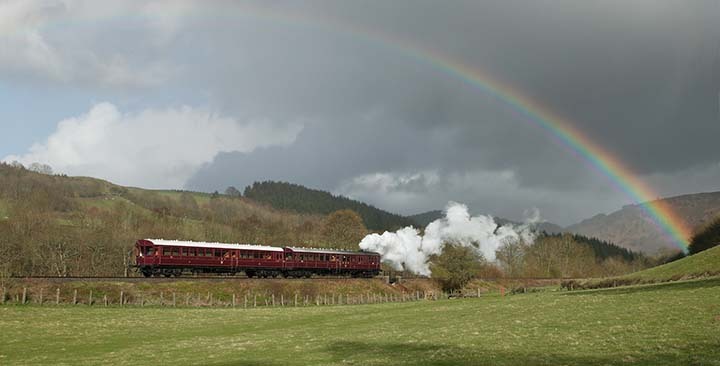 He was also very complimentary about the quality of work achieved by the staff at The Llangollen Railway and by the Great Western Society, observing that “The quality of the restoration is astonishing.”. 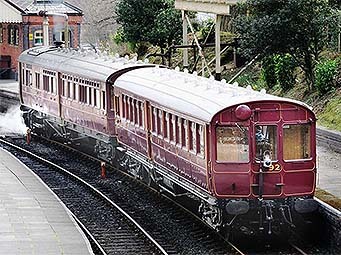 Following the launch, the railmotor and trailer were soon put to work giving rides to Railway Centre visitors throughout the bank holiday weekend, which, unuusally for significant events in the restoration story of these vehicles, remained fine and warm! The vehicles will remain at Didcot Railway Centre over the summer, operating on selected running days. See Didcot Railway Centre Website for details. 18 April 2013 marked the occasion of the Railmotor and trailer's first passenger run in preservation. 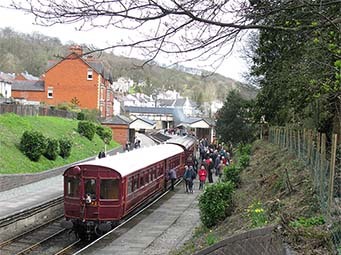 The reunification was made possible by the Railmotor's having travelled up to Llangollen to take the starring role in their Spring Gala. 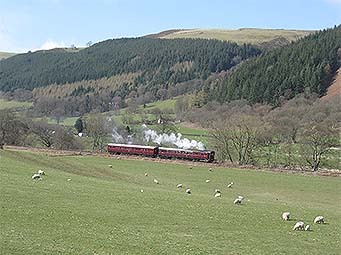 Thursday 18 saw a special contributors day, in advance of the 19-21 April Gala, when the well loaded train made two return runs along the length of the Llangollen Railway, for the benefit of those instrumental in the restoration of the vehicles. Great Western Society Chairman, Richard Croucher, made a brief speech on arrival at Carrog, during which he extended his thanks to all those who had helped in their various ways, and pointed out that the restoration of Trailer No.92 showed that it was important to keep such vehicles as well as we are able, even if they look to be beyond restoration, because one can never know what the future might bring. 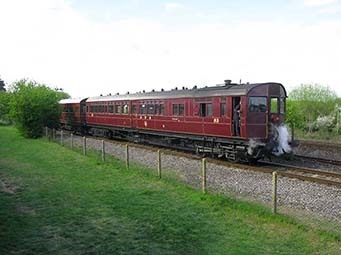 Following the Gala, both Railmotor and trailer are expected to return to Didcot for the summer, where they will first be in action over the May Day weekend. After last year's exploits on the Bodmin and Wenford Railway and on Network Rail's Looe Valley Line Railmotor No, 93 spent the Christmas period in a nice dry shed at Bodmin Road. 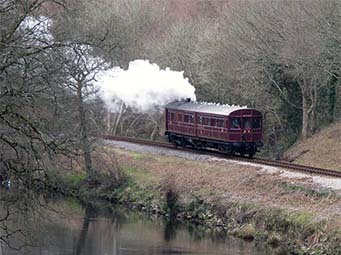 After a brief appearance at the New Year gala at Bodmin, the Railmotor was off on her travels again. 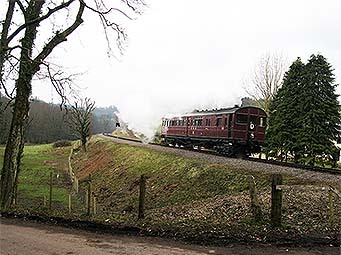 The first engagement of the year was to take pride of place in the South Devon Railway's Branch Line Gala over the weekends of 16/17 and 23/24 February. A glorious supporting cast of auto-trains, branch goods trains and even a 'first-generation' diesel railcar, made for two fabulous weekends, with the locomotives and stock perfectly complementing the branch line stations and setting. Given the historic links between the Great Western Society and the South Devon Railway it was perhaps unsurprising that many GWS members could be seen at this event, including David Lemar and Gillian Lemar-Collings dressed as Edwardian Lady and Gentleman (not necessarily in that order) and of course the GWS Bristol Group's travelling railmotor sales and information stand. 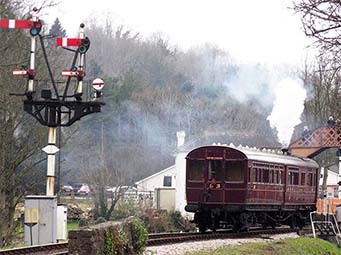 Following that, the action moved to the West Somerset Railway and their Spring Gala from 16-24 March. The nine day gala, involved the Railmotor on all days. The first weekend, which was cold and rather blustery with a tendency to extremely heavy showers, saw her use on a Minehead-Dunster shuttle. During the early part of the week there were a series of pre-booked all-line runs, including two on Wednesday run for the benefit of GWS members and arranged by the Taunton Group of the Society. Then in the final few days of the gala the scene moved to a Bishop's Lydeard to Norton Fitzwarren (Allerford Platform) shuttle, which on several occasions saw the rather unlikely spectacle of the Railmotor carrying a Cornish Riviera headboard! The weather on that second weekend was dry, but largely below freezing, and the WSR reported consequent visitor numbers to be down somewhat, but those that survived seem to enjoy the experience. 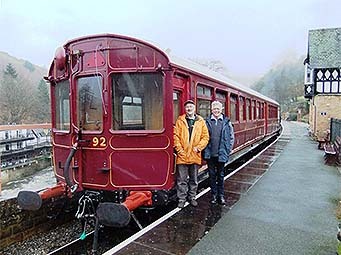 Railmotor No.93 will now travel to Llangollen to be reunited with the, now complete, Trailer No. 92 for their Spring Gala - 19-21 April. Following the proving trails at the end of January No. 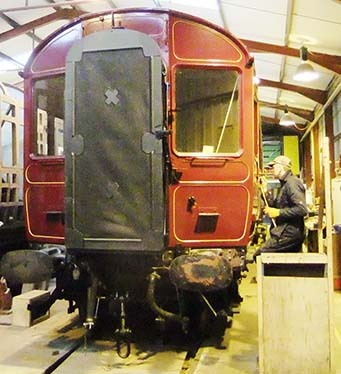 92 was returned to the Carriage Shed to protect it from the elements before it’s first public runs at Llangollen’s Spring Gala over the weekend of 19 to 21 April, when it will work for the first time in preservation with the Railmotor. 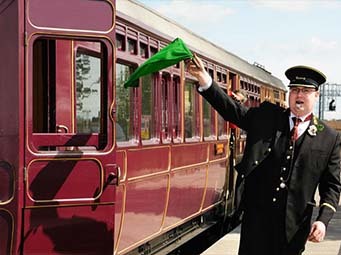 It will then return to Didcot along with the Railmotor for the Summer Season to allow visitors to experience at leisure the delights of Edwardian travel. The completion of No 92 brings to a formal end the Great Western Society’s Steam Railmotor & Trailer Project, and the Society, and in particular Project Manager Graham Drew, would like to thank all who have supported the restoration through both hard work and financial contributions to bring everything to a successful conclusion. 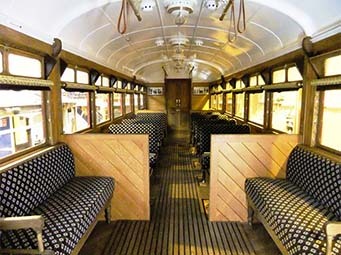 The large financial support given by the Heritage Lottery Fund and Society Members allowed the project to be completed (in railway preservation terms) in quick time, and the dedication of many volunteers, contractors and restoration teams has ensured that the Society now has a couple of historic vehicles that are second to none. Both vehicles will now be managed by The Great Western Society and Didcot Railway Centre, and news of their operation will be posted on the DRC website. On Tuesday 29 January 2013 GWR Autotrailer Number 92 operated for the first time since being withdrawn from traffic and condemned by British Railways in January 1957 – 56 years to the month since it last turned a wheel in service. 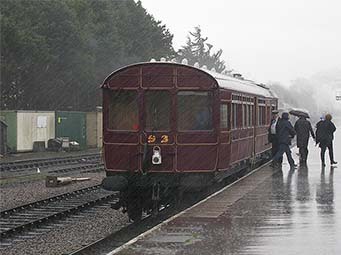 Llangollen’s Auto fitted Pannier Tank 6430 provided the motive power and interface to test the vehicle systems on a wet and windy day, which seems to have become a tradition for the Railmotor Project as the Railmotor’s power bogie was tested in similar weather. With Project Manager Graham Drew having the honour of being on the regulator, and with Society Chairman Richard Croucher in attendance trips were made to test the mechanical linkages and vehicle ride quality. 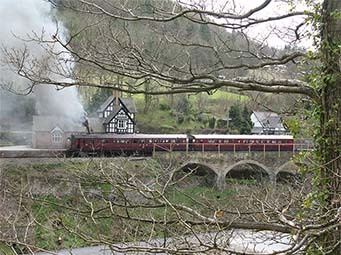 The trials proved successful, with running between Llangollen Station and Berwyn to prove that the coach did “what it says on the tin” before returning to works for a couple of weeks of cosmetic crossing “Ts” and dotting “Is”. 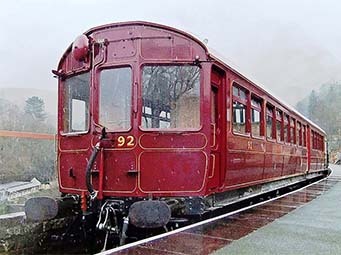 No 92 will make its first public appearance in traffic at Llangollen's April Gala event, when it will operate with the Railmotor No. 93. Both vehicles will return to Didcot Railway Centre after the Gala for the summer season.